Red = 30% probability of hail 1″ or larger within 25 miles of a point. 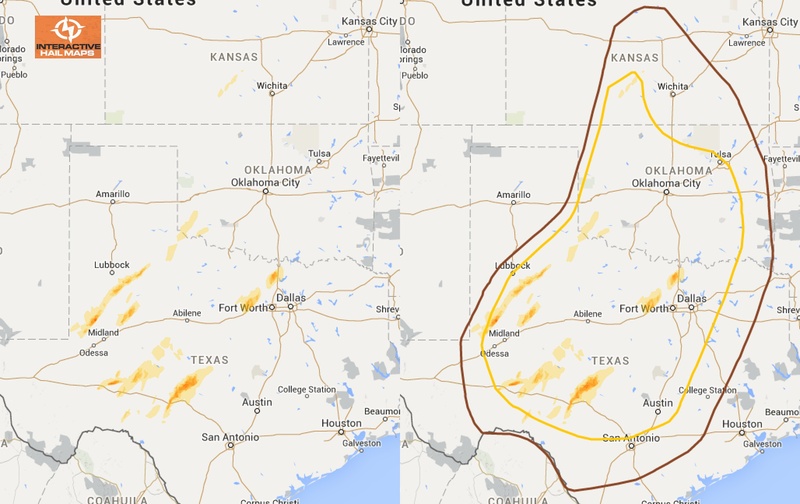 Black = 10% probability of hail 2″ or larger within 25 miles of a point. BOOM! The Storm Prediction Center gave us a bullseye, and they nailed it! Lots of big hail, almost all of it in the 30% zone, with a couple of minor swaths in the 15% zone. One late storm cross over into Mississippi, and a little bit of hail fell near Raleigh, NC, but those are just bonuses. For those of us wanting some fresh hail, there wasn’t a huge populated area pounded… But plenty of small towns & honey-holes out there with a fresh hail date.